‘Landolfi’s Sign’—Eyes Don’t See What the Mind Does Not Know! March 2, 2018	 Comments Off on ‘Landolfi’s Sign’—Eyes Don’t See What the Mind Does Not Know! Still frame of long-axis parasternal view on 2-dimensional color flow transthoracic echocardiogram showing severe aortic regurgitation. as depicted by arrow. The thick arrow at the bottom depicts the point of recording of the diastolic frame. AO = ascending aorta; LA = left atrium; LV = left ventricle. A 60-year-old woman was admitted with progressively worsening dyspnea on exertion associated with intermittent lightheadedness and palpitations. On physical examination, a 3/6 diastolic decrescendo murmur was audible along the left sternal border. The murmur was most prominently heard in the left third intercostal space at end expiration with the patient in the sitting position. In addition, bounding carotid and femoral pulses were present, and the pulse pressure was wide. 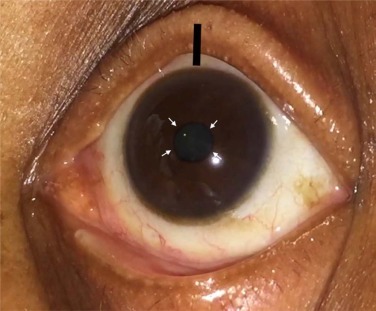 Careful examination of her eyes revealed alternating constriction and dilation of the pupils occuring in synchrony with the patient’s heartbeat, a rarely reported finding known as “Landolfi’s sign” (Figure 1, Video S1 available online). 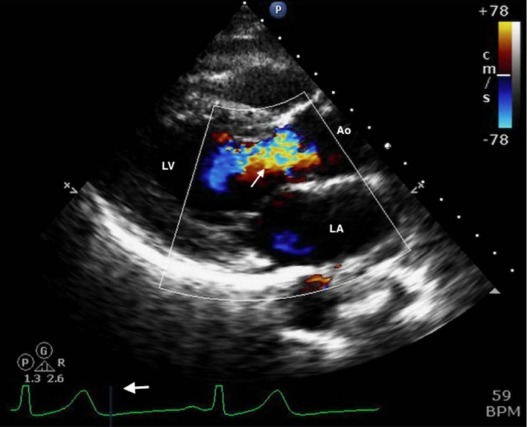 Figure 2 is a still frame of the long-axis parasternal view on 2-dimensional color flow transthoracic echocardiography showing significant aortic regurgitation as depicted by the arrow. 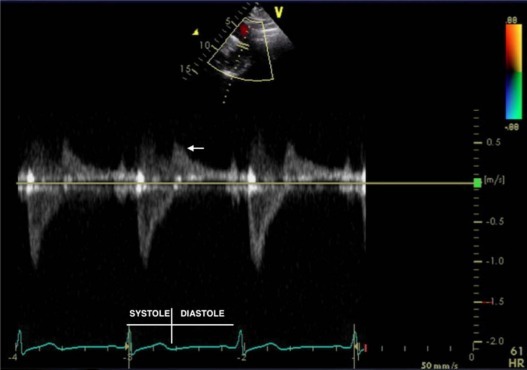 Figure 3 is a still frame of 2-dimensional–guided pulsed-wave Doppler from the suprasternal view demonstrating diastolic flow reversal at the level of the aortic arch–descending aorta junction (arrow), thus confirming severe aortic regurgitation. “Landolfi’s sign,” described by Michel Landolfi (La Semaine Medicale, July 28, 1909), is believed to be a result of an exaggeration of the physiologic circulatory hippus in the iridial vessels due to high pulse pressure and large stroke volume, thereby resulting in systolic constriction and diastolic dilation of the pupil. “Landolfi’s sign,” “Corrigan’s pulse” (bounding carotid pulsation), “Watson’s waterhammer pulse” (forceful extremity pulsation), “Quincke’s sign” (alternating flushing and blanching of fingernail beds), “de Musset’s sign” (rhythmic head bobbing), “Becker’s sign” (prominent retinal artery pulsations), “Müller’s sign” (systolic bobbing of the uvula), and “Duroziez’s sign” (audible diastolic murmur over femoral artery) are important manifestations of the hyperdynamic circulatory state seen in clinically significant aortic regurgitation. This article originally appeared in the December 2017 issue of The American Journal of Medicine.